Backyard (or rooftop, or fire escape, or whatever) beekeeping seems to be picking up steam, but I still found it maddeningly difficult to find a good primer online. A good beekeeping book is crucial, but I also like to do free research online whenever I begin a project - even a big one - and a simple primer on the equipment you'll need would have been really helpful in estimating what sorts of costs I would incur. So this post is just that. I'm going to go over the basic parts necessary to assembling a hive. In the next post, I'll discuss where to get the bees. Frankly, that's as far as I've gotten. My bees seem to like their new home; they've been busy building comb, and I'll continue to add bee-related posts as they develop their colony and I inevitably screw something up. First off, a disclaimer: I do not claim to be an expert on bees or beekeeping. I am one-hundred-percent new to this field. Like anything else on this site, this is meant to be a journal of successes and failures, a here's-what-I-tried, learn-from-my-mistakes sort of venture. I can offer no more expertise on this than my dog Huey can, except that I have the facility to read books, comb blogs, make purchases, and ask questions of friends and salespeople. Huey only barks at the bees. So take this all with a grain of salt. I wished that a "When I started beekeeping" journal had readily revealed itself on the interwebs when I began this. Much of the discourse in forums has more to do with whether or not to revert to small-cell comb than with questions like "What does a beehive look like?" or "Bees eat honey, right?" The answers: Keep reading - there's a diagram, and yes. 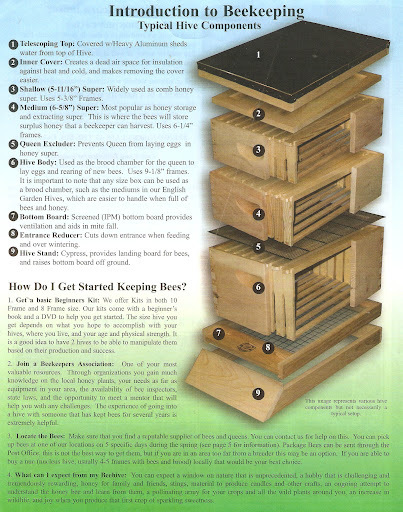 You will likely use a Langstroth hive. When I started this, I didn't know the parts of a beehive, or what functions they served - let alone how much money I might spend acquiring the stuff. Understanding the parts of a hive will help you understand the bees who will live there. I got all of my equipment at Brushy Mountain Bee Farm, who were wonderful. * I did quite a bit of cost comparison before I finally placed my order, and I don't regret buying from them. Their shipping was remarkably quick (assuming you don't order backordered items - always call to check), and the operators were very helpful. After that nice plug, here is an image that I stole out of their catalog. The image above is a Langstroth hive, which is the type of hive most commonly used for producing and collecting honey. There are other types of hives, of course, like the top-bar hive, and the iconic skep, but I'm going to discuss Langstroth hives here because that's all I know. 1. Telescoping top. It's "telescoping" because it hangs off the sides, providing eaves (roof overhangs) for the hive. 2. Inner cover. Helps insulate the hive, while still allowing for ventilation. 3. Shallow (5 11/16") super. Supers are used primarily to store frames of honey, and there are two different sizes - medium and shallow. Supers aren't something you'll need right off the bat (since your bees won't be making surplus honey immediately) - unless you're configuring your hive as I did, as described below. 4. Medium (6 5/8") super. Like the shallow super, this is placed on top of hive bodies for the bees to store honey in. However, I'm using medium supers instead of regular hive bodies (#6). It seems that a lot of beekeepers are starting to do this. A lot of my reasons for this can be found on Michael Bush's website (specifically here, here and here), but basically, it comes down to two reasons: I can use the same size frame (6 1/4") in every part of my hive, which simplifies things, and medium supers are lighter and easier to pick up than deep hive bodies. 5. Queen excluder/includer. This is used to keep the queen from going up into the supers (where, traditionally, you want just honey) and laying eggs. The spaces are big enough for worker bees to get through, but not for the queen. The book I used advocates letting the bees organize their hive however they want, including laying eggs in the upper part of the hive. However, you might use the queen excluder for some other reasons, down the road. 6. Hive body. In a traditional setup, this would be the primary component of your beehive, where the bees would lay eggs and raise brood. However, like I mentioned, I don't have deep hive bodies in my setup, as I'm using all medium supers (#4). 7. Bottom board. Some bottom boards are just solid wooden boards that serve as the floor of the hive. The one shown here has a screen in the bottom that aids in ventilation. The screen also supposedly helps to reduce varroa mites, which are a big problem for beekeepers. Theoretically, the mites fall off the bees, go through the screen, and then can't get back up to the bees. The gridded panel below makes it easier to count the mites that fall through - fun! 8. Entrance reducer. The super or hive body (whichever you use) will be raised about 1/2" off of the bottom board, making a 1/2"-tall opening that runs the whole width of the hive. The bees have to defend their hive from intruders (hornets, mice, and robber bees from other colonies) - and this is a lot of area to protect. The entrance reducer blocks most of that area and leaves just a small opening to defend. 9. Hive stand. Raises the hive off the ground and makes a nice landing area for the bees. You'll still want to make a higher foundation for the hive, but you can use this on top of whatever you use - wood cinder blocks, or scavenged limestone, like we used. (10). Not numbered in this diagram - but very important - are frames. You can see wooden frames in the cutaway of the supers and the hive bodies. Frames come in three sizes - for shallow supers, medium supers, and (deep) hive bodies. They may be plastic or wooden, assembled or unassembled, already fit with foundation, or not. I ordered frames to fit my medium supers - wooden, assembled, no foundation. I'm really glad I ordered them pre-assembled; it saved me a lot of trouble. I'll get to foundation later. You can choose between 8-frame hives and 10-frame hives. 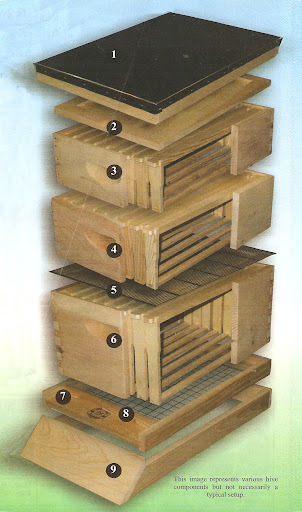 10-frame hives are wider because they accommodate two more frames. They are heavier, but they have greater capacity. As for the all-super setup that I used - I read about it on several blogs and forums, and the idea of heaving less weight to lift appealed to me. So did the simplicity of being able to use the same size frame in any part of my hive. I'm sure there are drawbacks to it, but I decided not to overthink it. It seems that a lot of beekeepers are shifting to this setup, and several pre-configured beginners kits even take this tact. You'll also need, at the least, a veil with a hat, a smoker, some long gloves, and a hive tool. All of my supplies cost, with shipping, a little over $200. You'll need wood glue and nails on hand to assemble your wooden components when they arrives. For hives bodies and supers: pick out the four parts that comprise each super - two long and two short sides. Assemble them dry first, to loosen up the dovetail joints. Now lift off one end, and put a good dab of wood glue on every side of every dovetail on the side you've lifted off. Fit it back into place, hammering it in with a rubber mallet if necessary. Fix it in place with two long clamps, and repeat on the other side. Once that side is glued and fitted on, drive in one nail on each side of that end. Turn the super over, and nail in the side you glued before. Turn it back over and drive in the remaining nails on the other side. Wipe up all the excess wood glue with a damp rag as you go. For the hive stand, you'll need to pre-drill nail holes with a small bit, then square up the stand and drive nails in. I stained the outside of my supers, the top, and the hive stand with water-based Zar brand stain, and sealed them using Outdoor Mod Podge. I diluted the Mod Podge a bit with water (since it's basically glue), and it still hasn't set to a nice hard finish - it's a little bit tacky, and I wonder if diluting might have caused that problem. In any case, use only water-based products on the hive components, and don't paint or stain any surface that the bees will come into contact with - the bottom board, frames, inner cover, or the inside of the supers or bodies. Buy the frames pre-assembled (which I'm grateful I did, even with the extra cost), or follow these instructions. I chose to forgo foundation in my frames. It seems to me that bees pretty much know how to build their own combs, and I'm not interested in adding chemicals or too many outside elements to their homes or my honey. Foundation is generally plastic, and sits inside the frame. It is embossed with a cell pattern that encourages the bees to draw comb on top of it in a prescribed, neat configuration. Foundation is generally imprinted with a large-cell (the hexagons that comprise honeycomb) pattern that encourages them to build large-cell comb. The authors of The Idiot's Guide to Beekeeping are advocates of reverting to small-cell comb. They assert that bees have been bred and trained to build larger-celled comb, and to grow larger themselves. Returning bees to their natural size, they say - via the size of their comb cells - can help us avoid many of the problems that plague modern beekeeping, like varroa mites. I considered using Honey Super Cell, a small-cell plastic comb, once my bees arrived, or else using a medium-cell foundation and stepping down to small-cell. However, many beekeepers seem to think that the small-cell movement is not the silver bullet it professes to be and that, furthermore, reverting to small-cell comb simply isn't an endeavor for first-time beekeepers. So, unless I eventually decide to try reverting to small-cell, I'm using foundation-less frames. Instead of foundation, I used starter strips, advocated by the Backwards Beekeepers (discussed here), using jumbo craft (popsicle) sticks. Each frame is about two-and-two-thirds craft sticks wide. I broke off one third of several of the sticks, and broke others into thirds. I laid them out these and unbroken sticks in alternating patterns, two layers deep, since that's how deep my frame grooves are, and glued them together with wood glue. In this way, I made thirty starter strips that are two-and-two-third sticks long, and two sticks thick. Then I used a little wood glue to put them into the grooved frames. I melted some organic beeswax, and brushed a thin layer onto each side of the starter strips. It took me about an hour and a half to make and coat 30 starter strips. So that's how my setup goes. There are plenty of others, and I really can't discuss the advantages and disadvantages because I haven't gotten to experience any yet. I do think that knowing the parts in a hive, and what they're meant to do, can shed a lot of light on the process of beekeeping - so learning the equipment is a good place to start. Where to put this equipment - and the bees - is another important consideration. And hey - it might be a good idea to check that beehives are legal where you live, although I didn't, and I foresee no trouble. 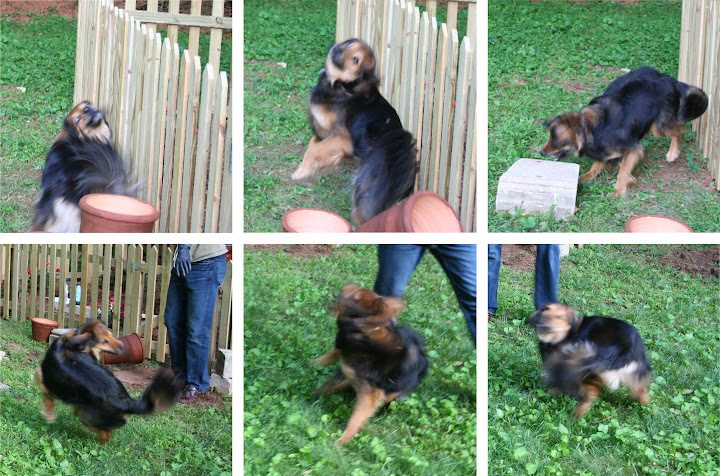 My sweet and handy husband built a custom fence to deter our dog from eating 10,000 honeybees, but that hasn't dampened his enthusiasm for trying. Next time, I'll post on where to get the bees, and how to put them into your fancy new equipment. *I'm sure it goes without saying on this little small-time blog, but that company is not paying me or otherwise inducing me to say nice things about them. I just liked them. Several decades ago, Boy Scouts had a badge for Beekeeping. That would be an excellent source for you. Clara - you are all over this! That is SUCH a great post that you found. It sounds like she has bee traps all over her neighborhood. Those seems like something you could ask to put in your neighbors' and friends' yards, with the promise that you would quickly retrieve any swarms that they lure. Not in the handbook, but one of the merit badge books. Great summary! You may also enjoy reading the archives of the Birdchick's blog, wherein Sharon Stiteler keeps bees with Neil Gaiman. They have had quite the adventure with more than one hive for several years now.